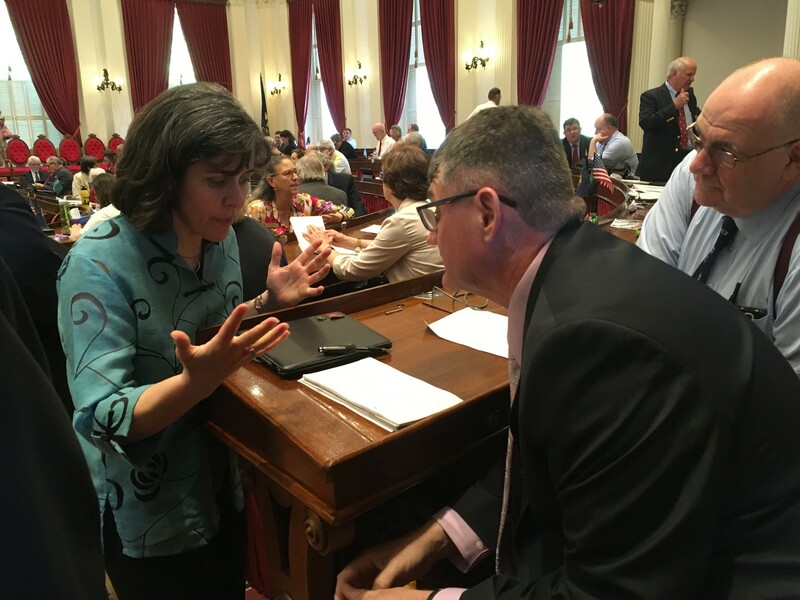 House Speaker Mitzi Johnson confers with House Minority Leader Don Turner on Wednesday over the House's schedule. Vermont lawmakers locked in a showdown with Gov. Phil Scott appear intent to make it harder for him to make good on his threat to veto the budget bill. Legislators plan to fold an affordable-housing bond that Scott strongly favors into the budget bill. If he vetoes the budget, he essentially kills his own puppy. The move came hours after legislative leaders pulled the plug on stalled negotiations with the governor over what to do with savings from less expensive teacher health insurance. Lawmakers expect to hash out their own teacher health care solution and sign off on the budget bill as early as Thursday. Rep. Sam Young (D-Glover) said he and fellow House and Senate conferees on the housing bill settled final differences Wednesday afternoon over how to fund debt service for a $35 million housing bond. In the process, they agreed to fold the bill into the budget bill that the governor is threatening to veto, he said. The housing conferees agreed to extend for 10 years an existing property transfer tax that funds water-quality efforts. The first $1 million of next year’s revenue from the tax will pay the debt service on the housing bond. Democratic legislative leaders and the Republican governor all support the housing bond, but were at odds over how to fund the $1 million. The Senate briefly considered a $2-a-night lodging tax before settling on the property transfer tax, which unnerved environmentalists.